The Split Riviera is the largest city on the Adriatic coast famous for the Diocletian Palace. 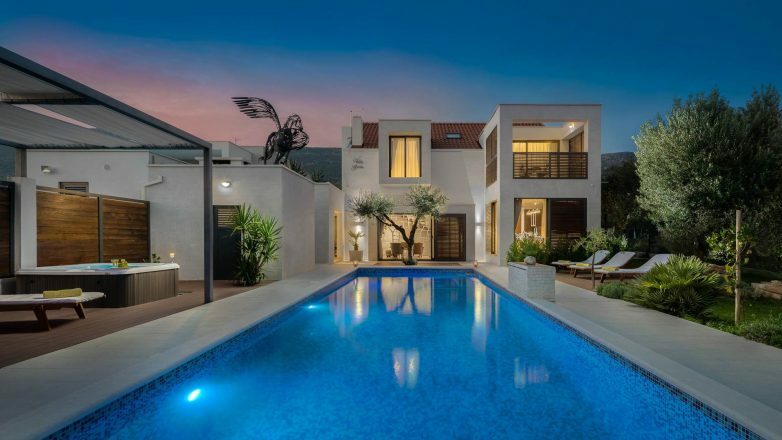 While our Villas in Spilt are not quite the Diocletian Palace, you can rest assured of a luxury stay on the Split Riviera. Although called a palace, it appears more like a fortress and takes up a large majority of the city centre. The Diocletian Palace is a pleasant mix of old and new, where you can explore the crumbling ruins of this ancient palace whilst also browsing the modern shops and restaurants that reside within its walls. Like the rest of Croatia, Split offers a wide range of quality food and drink and also a great transport hub from which you can visit many parts of Croatia, including Brač Island and Hvar, with Split as your base. and immerse yourself in the wonderful Croatian climate, relaxing on the sunny beaches such as Bačvice where you can take advantage of the clear seas and the water sports that are on offer. 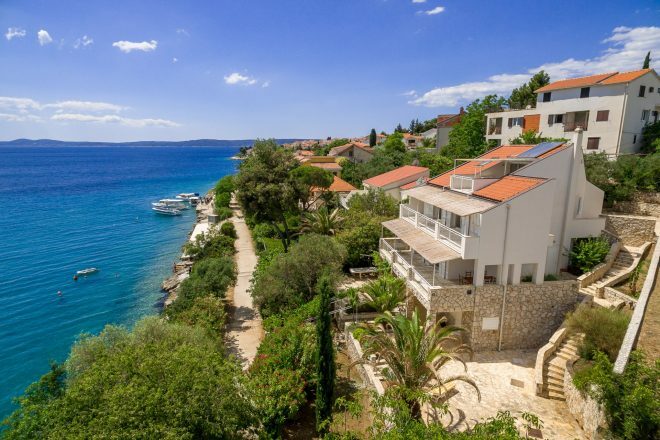 If active is what you are looking for with your luxury Croatia holiday, Split is the place to be with the Marjan Hills, also known as the “lungs of the city” where you can enjoy the breath-taking views and wild vegetation. You can hike to the top or bike one of the many trails, making the most of the pleasant climate and one of Croatian’s many natural creations. If you are searching for a city break filled with history, gorgeous surroundings and easy access to the rest of Croatia, Split is the place to be. 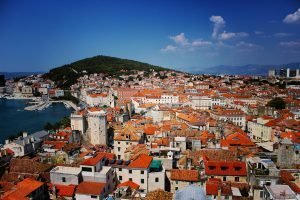 Check out our Tourist Guide to Split below for a full list of things to do and see, history and the types of food you will encounter in the city. 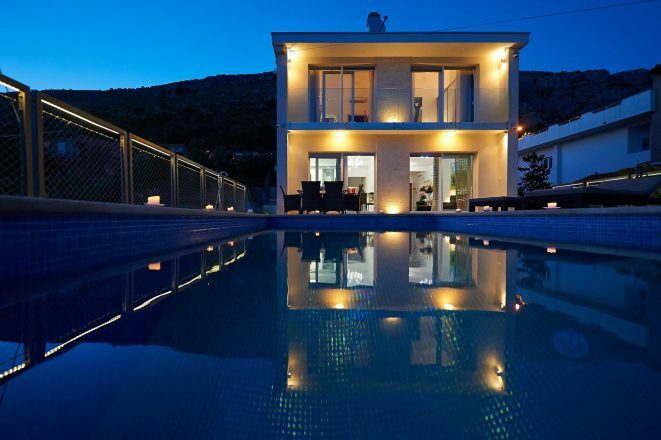 Book your Croatian villa holiday down below, choosing for a wide selection of carefully chosen luxury villas in Split. Most of the towns and villages along Split Riviera were founded by Greeks around 2nd or 3rd century BC and thrived tby trading with the surrounding tribes. The Roman Empire soon became dominant in the Split region when Roman Emperor Diocletian ordered a palace to be built here for his retirement. 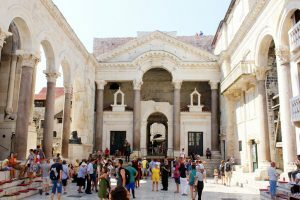 Completed in 305 AD, just in time for Diocletian to retire and is therefore known as the Diocletian Palace. The invasion of the Avars and Slavs in the early 7th century saw the city fall with little resistance. Local inhabitants sought sanctuary behind the Diocletian’s Palace walls. The citizens proceed to build a city within the palace walls which takes a similar form to the shops and markets that are there today. In 1420 Split was conquered by the Venetian Republic. They ruled over Split, developing it into a significant port city with great trading relationships, until 1797 where Split fell to the Habsburg Monarchy. Split was devastated during the World Wars with hundreds of casualties and many citizens lost as a result. Post WW II, Split experienced substantial growth due to large government investment which saw factories built for a range of industries. Split developed a large ship-building industry that saw Yugoslavia become one of the world’s top countries in the field. Alongside this Split also became an important worldwide port. 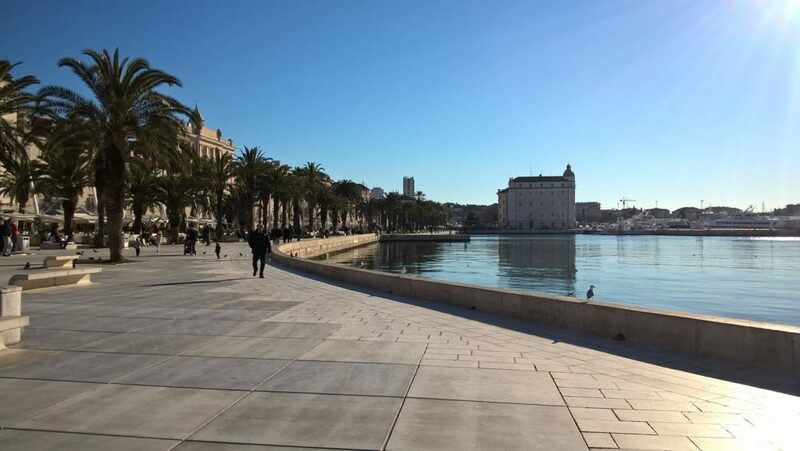 Now, Split is part of the independent Croatia and one of the most successful tourist locations on the Adriatic Coast, attracting millions of visitors each year. With such a rich and cultured area, you will never be at a loss of things to do. Split cuisine is a unique fusion of Mediterranean, Venetian, Turkish and Central European influences. It is home to both a mix of coastal and island cuisine infused with traditional Dalmatian properties. The attractiveness of many Dalmatian dishes is in the quality of food. The fish is some of the best you’ll taste, having been freshly caught that day on the vibrant Adriatic coastline. Natural, home grown vegetables and healthy meats such as lamb and goat create rich dishes reflect the quality of the Split upbringing, with diverse flavours prepared using local herbs & spices. Stuffed peppers are an ode to the regions Mediterranean heritage, fish stews & risotto and grilled meats are all dishes you will find expertly prepared in Split. 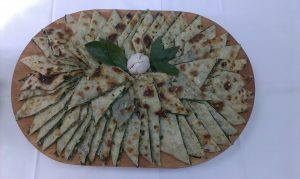 Local specialities include soparnik from Omiš which are pies filled with spinach, onion and parsley. If you have a sweeter tooth, desserts like rožata, a sweet custard pudding or fig ravioli can be found full of local liquors and spices. Kroštule is a traditional pastry that is similar to a doughnut and paradižot which is a sweet pudding-like dessert that is made with eggs, milk and cookies. Split Riviera is the perfect for location for foodies and fussy eaters alike, whether you are looking for expertly prepared dishes or want to sample the traditional and local cuisine. 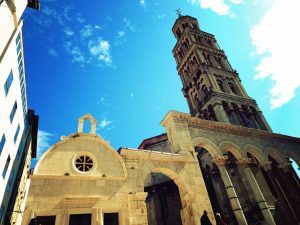 Split is a shining jewel in the necklace of Dalmatia. The current old town is a bubbling hub of heritage and culture, all built away from the focal point of the Diocletian’s Palace, which was originally started in 300 BC. This is the heart of Split and a UNESCO World Heritage Site. The Palace is also a filming location for popular TV show Game of Thrones with many tours available for fans of the show. Learn more about Game of Thrones filming in Croatia. Visitors can also climb the steps of the bell tower of the Cathedral of St Domnius, which was built in the 7th century and is regarded as one of the oldest Catholic cathedrals in the world. It is said if you touch the toe on the statue of Gregory of Nin, you will have good luck. Outside of the palace is Fortress Gripe, which was built in the 17th century and is a living reminder of the defences against the Turks. It is also home to the Maritime Museum, which holds a collection of nautical equipment and historical pieces. If you are a nature lover, Marjan Hill highlights the carefully preserved Split landscape and is a joy to climb for the wonderful view it offers of Split. The surrounding areas around Split offer great hiking and biking trails. The town of Trogir will take your breath away with its preserved forts and historical monuments. The pirate town of Omiš is also home to famous forts that date back to the 13th century. Solin, known as the ancient Salona, is a perfect destination for those wishing to see true history and visit the ancient ruins of early Roman settlements. 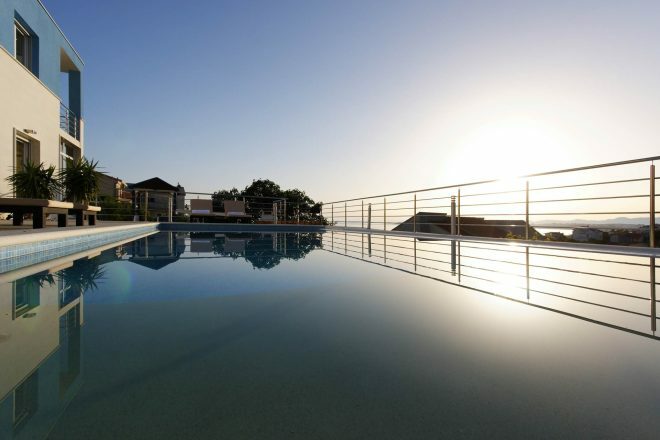 Split Riviera is not only beautiful but also offers a range of facilities and activities.